Metro-Goldwyn-Mayer and Twentieth Century Fox Home Entertainment have just announced another bloody season of the television series Vikings to be released on Blu-Ray Disc and DVD this fall. The gripping family saga of Ragnar, Rollo, Lagertha and Bjorn continues as loyalties are questioned and bonds of blood are tested. Now king of his people, Ragnar remains a restless wanderer, leading his band of Norse warriors on epic adventures from the shores of Essex to the mythical city of Paris. But stunning betrayals and hidden dangers will test Ragnar’s courage and strength like never before. The DVD version will also contain the two-part Featurette ”Athelstan’s Journal”, as well as ”Heavy is the Head: The Politics of King Ragnar’s Rule” and ”A City Under Siege: Creating and Attacking Paris”, along with a number of Deleted Scenes. The Blu-Ray version contains all the same bonus features, but further expands upon it with the inclusion of Extended Versions of All Episodes, as well as ”The Guide to the Gods”, an interactive exploration of the various Gods in Nordic mythological lore, which include: Odin, Thor, Loki, Frigg, Baldr, Hel, Freyja, Freyr and Njordr. An Audio Commentary on “Born Again” and “Breaking Point” featuring Michael Hirst and Linus Roache is also included on the Blu-Ray version. 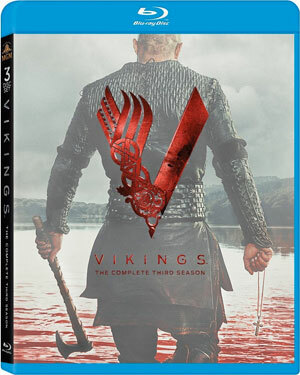 Scheduled for release on October 6, “Vikings: The Complete Third Season” can be yours to own for $59.99 on Blu-Ray Disc and $49.98 on DVD.